The third day of workouts end at the NFL Combine. Sunday was potentially the most important day of the Nfl Scouting Combine for the New York Giants as the team got to evaluate players on the front seven. Defensive lineman and linebackers worked out and quite a few of them stole the show. As a whole group, for the most part, a lot of the defensive line talent has helped their stock during the Combine. Arguably the most athletic position in this year's draft, the Giants will have plenty of selections to rebuild their defensive line. Emmanuel Ogbah: Physically, he may fit the bill completely as a prototypical Giants defensive end. He's got the size at 6-foot-4, 273 pounds with 35-inch arms. What was made apparent on Sunday, was his athletic skills. His best 40-Yard Dash was timed at 4.63 seconds which is blazing fast for a 270-pound player. His vertical and broad jump were third best in both categories which is a great indicator of burst and explosiveness. He's got the build and the athleticism of a Giants defensive end for sure. 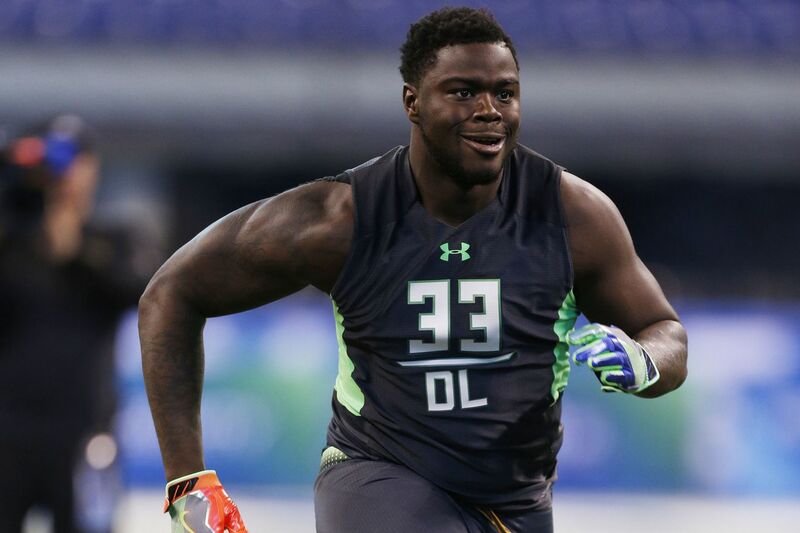 Shaq Lawson: Lawson is a tad bit smaller than Ogbah being one inch shorter and four pounds lighter. However, he's still in that prototypical build range for a 4-3 defensive end and he also turned heads during the workouts. Lawson had the fourth-best 40-yard time for all defensive lineman with a 4.7. He has the straight line speed but he also timed very well in the agility drills with a 4.21 time in the 20-yard shuttle and a 7.16-second mark at the three cone drill. The knock on Lawson, according to the official NFL website, was that the tape showed average athleticism. With the combine showing anything but that, could he be at play for the number 10 pick in the draft? Andrew Billings: On tape, scouts have pegged Billings as one of the top nose tackles in the draft base don his sheer strength. On Sunday, Billings showed off his wheels as he posted a 5.05 40-yard dash as a 311-pound lineman. His movement and agility in the drills were impressive for a player his size. Billings could be a dark horse candidate for the Giants at No. 10. Sheldon Rankins: In the same boat as Billings, Rankins looks to be one of the first defensive tackles taken. His jumping drills top every interior defensive linemen prospect but he has also looked agile and fluid. It's looking like a great year for defensive line talent. "If he doesn't go in the first 20 picks I'll be stunned." Mayock on Sheldon Rankins. You're on notice, Saints. Noah Spence: Projected as one of the best edge rushers available, Spence may have demolished his stock on Sunday. His workouts were solid but unspectacular. His 4.8 40 yard dash isn't terrible but is topped by the likes of Shaq Lawson and Emmanuel Ogbah who significantly outweigh Spence. Spence did get top marks in the jumping drills but did not stand out from the likes of Lawson or Ogbah. Spence also had off the field concerns as well and reportedly, Spence had less than favorable interviews. Robert Nkemdiche: Continuing the theme of interviews, Nkemdiche reportedly had poor meetings with NFL personnel. While he had a solid day of workouts, his physical traits were never in question. In fact, several teams have taken him off their boards entirely. Amid reports some teams have taken Robert Nkemdiche off their boards I can report he does have 15 individual visits already set up. Myles Jack and Jaylon Smith are the top two projected linebackers in this year's draft but injuries caused them to both miss out on participating in the Combine. Teams are very worried about Jaylon Smith's health as he could be suffering form nerve damage. Jack was expected to miss out on the combine as is still recovering from a knee injury. Scouts are still high on Jack as one even called him "the best player in the draft." It's not all doom and gloom for the linebackers. Darron Lee from Ohio State stole the show. At 6-1, 232 pounds Lee's 4.47 40-yard dash was better than many receivers in this year's class. He also excelled in the jumping and agility drills, often placing top five in his position. Lee could have jumped in being a first-round pick with his performance. #OhioState LB Darron Lee runs a 4.47 & 4.49 40s. Spoke to an NFL scout who thinks he will be the best NFL player among these 14 #Buckeyes.